Last week was the first of the summer workshops! What a hoot! Met a bunch of really talented and awesome folks (who are HOPEFULLY READERS NOW!) 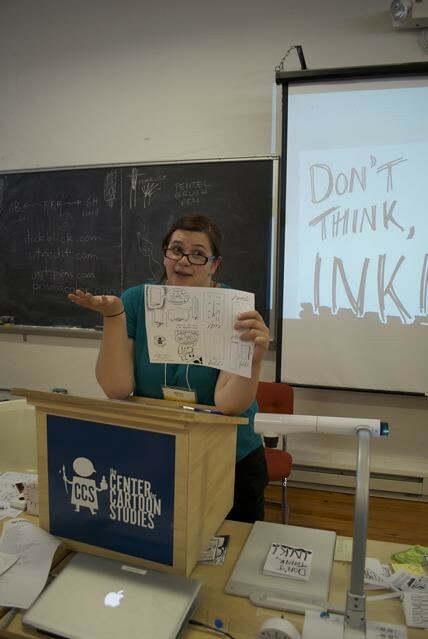 and taught a really fun One Sheet Workshop session. What's even more cool about that was my darling roommate and friend Jen Vaughn was taking photos and is writing an article for a top secret magazine that I might be in... check out the "new" face of comics! Also, this is just a heads up, friends, your books are in the mail if you ordered, and so ya'll know, the next two weeks might have really short/sappy posts as it's the final stretch of my time in White River Junction so bare with me, okay? But if you want to read a REALLY great article written about The Center for Cartoon Studies and how great it is, and see a quote by ME, click HERE Have a great Wednesday! Oh, and being as tech-savvy as I am, NICE DOCUMENT CAMERA! hahaha, do you mean the Elmo?